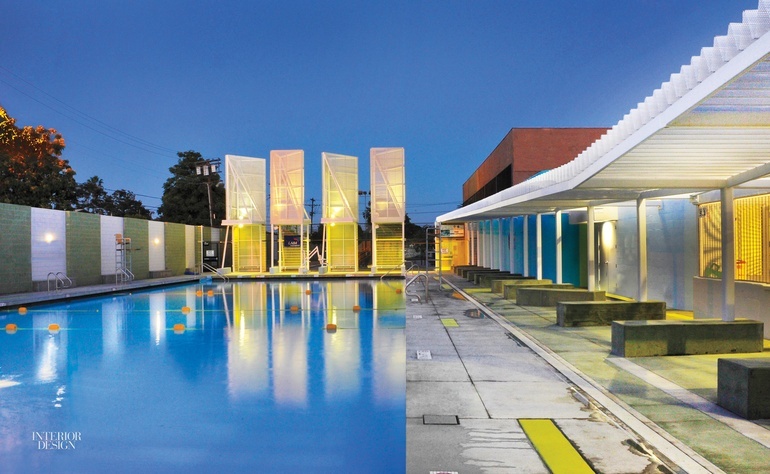 Once a dingy eyesore, this swimming center is now a bright spot in a low-income area, with zigzagging white entry canopies that beckon residents to come and cool off. Even from blocks away, four 30-foot-high triangular shade towers for the pool deck make the facility visible. “We thought the neighborhood needed a beacon of safety and recreation,” founding partner says. The rebirth comes after a long dry spell. In 1994, the Northridge earthquake damaged the facility, forcing maintenance crews to scramble to keep the leaky pool online. It eventually closed in 2004, leaving area kids without access to a place to swim. Finally, in 2013, city government put together a patchwork of funds for renewal of the 140-foot pool itself as well as the outdated bathhouse, built in 1970. Lehrer made the best of a tight budget by constructing the canopies from corrugated, perforated aluminum, painted white, and by painting the facade a summery yellow. To brighten the 5,800-square-foot interior, he punched skylights in the roof and added reflective paint. The deck’s pool-facing rear wall is graffiti-resistant concrete tinted with vertical green stripes. Combine them with new drought-tolerant trees and landscaping, and you’ve got an urban oasis. Project Team: Benjamin Lehrer; Erik Alden; Alexander Clark.